The image of disciplined German soldiers methodically destroying their tanks so that the enemy does not get them is spread through popular history, but, in reality, was not true. The Red Army captured plenty of fully functional tanks, some in the first battle they ever participated in. They captured so many, that the issue of re-arming them came up. Re-arming German tanks with domestic guns would solve the problem with ammunition supply, if not the problems of parts and high-octane gasoline. The question was first raised in 1942. 76 mm F-34 tank gun on the PzIV tank. 45 mm tank gun on the PzIII tank. 45 mm tank gun or 20 mm ShVAK autocannon on the Pz38(t) tank. 122 mm howitzer M-30 on the StuG SPG. Currently, Sinilshikov is only dealing with re-arming the StuG. His team already started developing a project. 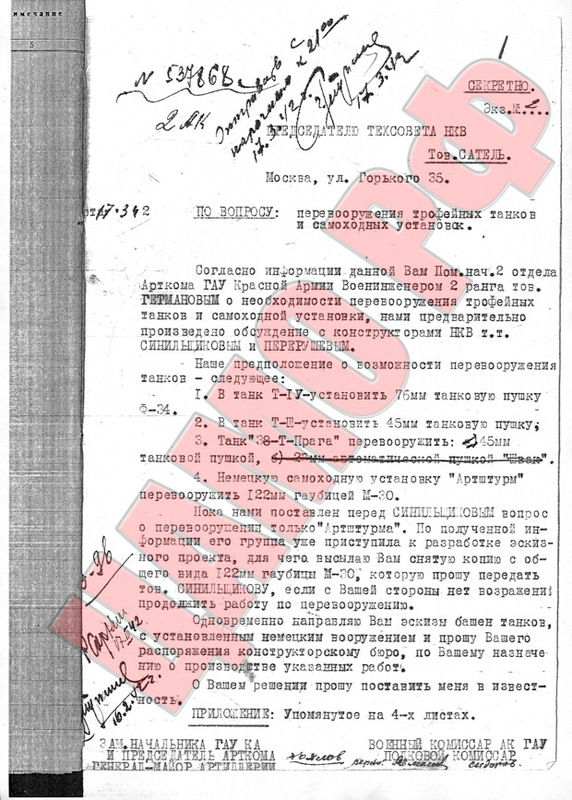 I am sending you a copy of the M-30 schematic, and if you do not object, please pass it on to comrade Sinilshikov. I am also sending you sketches of other turrets with German guns installed, to be used as you deem necessary. Keep me informed on your progress." The M-30 project is the only one of these that went anywhere, creating the SG-122 (Self Propelled Howitzer, 122mm). 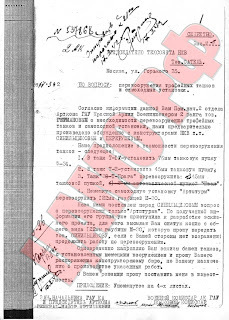 21 SG-122s were built out of StuGs and PzIIIs, but by that time the SU-122 was no longer used, and the equivalent SG-122s were sent to tank schools. Additionally, a project to install a 76 mm tank gun on the StuG was launched, creating the SU-76I, in 1943. 201 were built. A project to re-arm Tigers and Panthers was also launched. The Panther would receive an 85 mm gun and the Tiger a 100 mm gun. 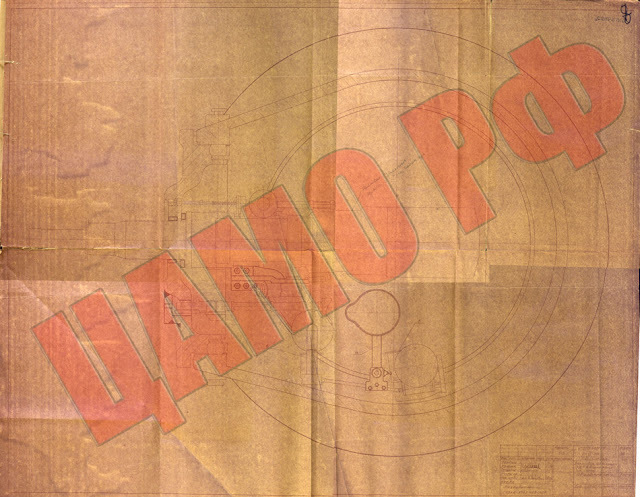 Here is a blueprint of a Tiger turret with a D-10T and a TsH-17 sight. By 1945, the obsolete tanks were dropped and estimates on the work necessary were made. A PzIV took 80 man-hours to convert to a ZiS-5 or a F-34. A Panther getting an 85 mm gun took 120 hours. A Tiger getting the D-10T took 90 hours. A fragment of the blueprint shows the true name of this chimera: T-VI-100. 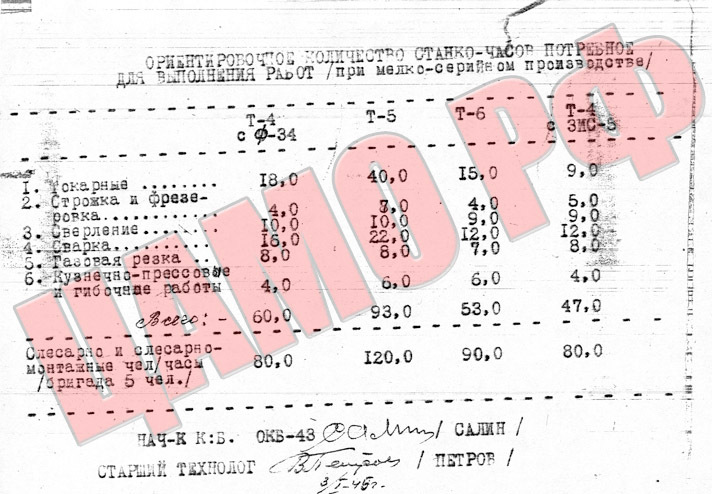 However, by 1945, victory was near and the tank shortages of 1941/42 were long behind. Captured tanks were no longer needed by anyone except museums, and work on re-arming them stopped.